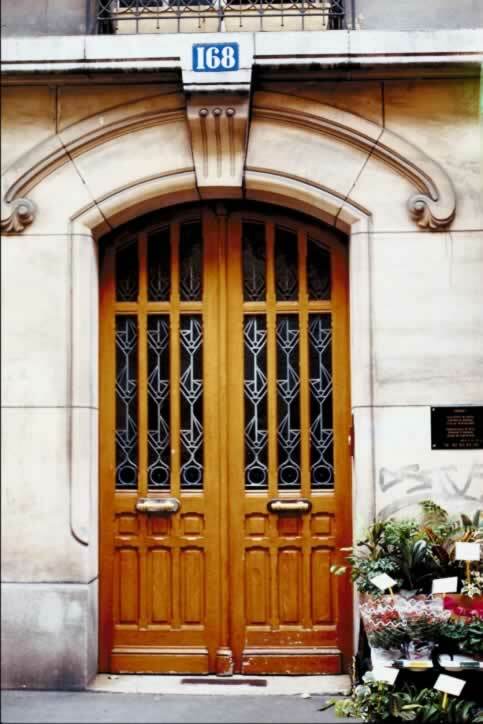 These double exterior doors form what's considered an elliptical arch, which is more square or flat than a rounded arch. Each door is framed by five rails (horizontal pieces) and four stiles (vertical pieces), making these doors have sixteen panels each. Half the panels in each door are lites--the name given to windows places within a door. These particular lites are all leaded with a decorative shape. The three top lites in each door are about half the size of the second three lights. These windows take up more than half of the door. On each door's midrail is a vertical bar mounted on a plate. The three panels beneath the door's mid rail are square and are the smallest panels. The remaining three panels of each door are the approximate size of the top lites. Each door is fitted with a polished brass kick plate.